Pittwater Online News continues with a focus on the summer art exhibition Artspot, coming to Avalon Recreation Centre in the New Year, open from January 5th to January 13th. Each week we will be highlighting Artists to give you a taste of the variety of artworks to be featured in Artspot. This week we focus on Artspots’ book launch and portrait works of Stephanie Brown and the two international guest artists from South African who are part of a movement called SUPERSTROKE. North Narrabeen resident and artist Stephanie Brown has completed an ambitious art project called Face of Extraordinary: Volunteers. Following the Black Saturday fires in Victoria, Stephanie was inspired by the courage and dedication of the volunteer CFA fire fighters after witnessing firsthand their exhaustive and fearless efforts to protect the lives and homes of others with little regard for themselves. Concerned that we do not hear enough about the crusades and kind deeds of those who give us hope and inspiration in times of need, she returned to Sydney to discover other extraordinary individuals within her own community. Portraits of 22 volunteers with each portrait 40 cm2, painted in oils and wax were produced over a two year period and will be on exhibit as part of Artspot. Stephanie will also be launching the book created for the portrait exhibition titled Face of Extraordinary: Volunteers featuring an author talk on Sunday January 6th 11am at Avalon Recreation Centre. The book combines the portraits and personal stories of many volunteers who work for various non-profit organisations and groups in the Northern Beaches area. Conrad Bo is the founder of Superstroke style which focuses on expressive brush strokes, dripping and criss-cross movements, resulting in plus (+signs) symbolic of its energy. 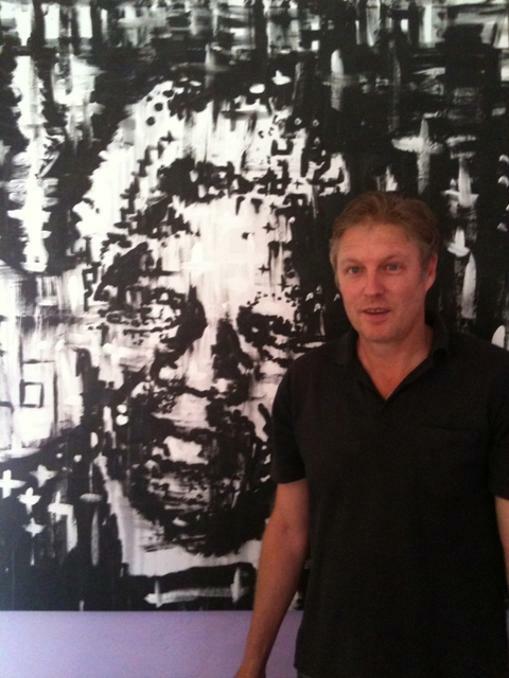 Conrad’s work is large and evocative, focussing on repetition via a series of portraits, a stand out being the unique piece featuring Nelson Mandela. 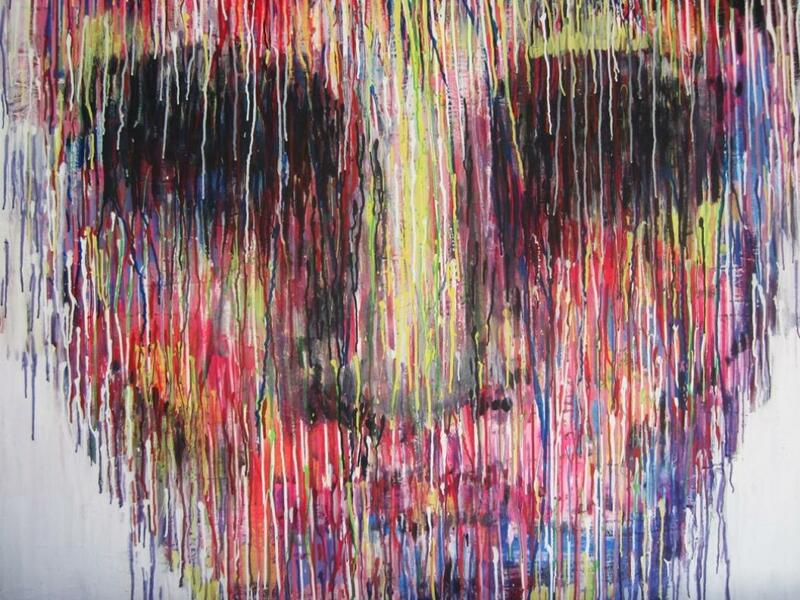 May Wentworth is a painter who, as a member of the Superstroke Art Movement simultaneously paints in a minimal but expressive style, using both line and texture to bring to life the singular but complex character of Mr White. Mr White has evolved over time and for Artspot he is somewhat more menacing and dark, a suited corporate figure reflecting the dire economic times the world is now in. This figure was never seen doing anything, instead he was seated and staring straight at the viewer, his mask no longer fixed but slipping. May is represented by the Living Artist Emporium in Johannesburg. Diezel, a local emigrated resident of northern beaches, featured in earlier articles on Artspot is also a member of Superstroke. Diezel’s works often features animals which she sees as metaphors for humans and the complex lives we live. For this exhibition most of Diezel's works are done in the 'expressive superstroke drips' where each drip represents an experience that shapes the subject as a being. Diezel uses extreme colours and black and white contrasts to symbolise opposing elements and conflicting emotions. Artspot will feature 17 artists ranging from emerging too professional with two international guests joining us from South Africa. An array of fine arts is on show including paintings, artist prints, ceramics, photography and sculpture. Artists include Meredith & Gemma Rasdall, Diezel, Cindy Goode Milman, Lorraine Beal, Stephanie Brown, Jackson Davies, Jessica Watts, Blue Stuart, Christine MacKinnon, Julia Sample, Michele Petrie, Caroline Munro, Emily Sandrussi, Angus Benham, May Wentworth and Conrad Bo. Location: Avalon Recreation Centre, 59A Old Barrenjoey RD, Avalon, NSW, 2107. Opening Night: Friday 4th January 2013, 6.00pm-9.00pm. Opening Times: 10.00am – 5.00pm. Author Talk: Sunday 6th of January at 11.00am.